The “Elements of Value” HBR article by Bain & Company Partners (Eric Almquist, John Senior, and Nicholas Bloch) is a must read for Brand Builders. 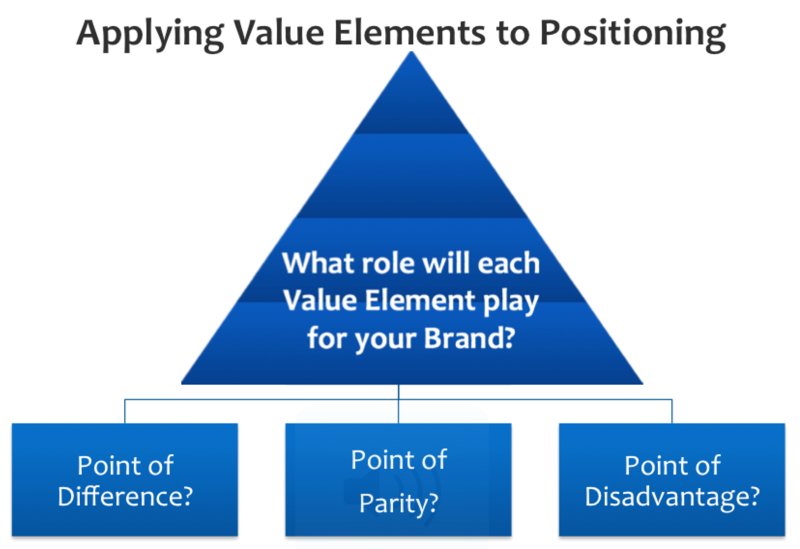 While the authors don’t specifically discuss “Brand Positioning” and Points-of-Difference / Points-of-Parity, their 30 Elements Pyramid is a “must have” tool in the toolbox for anyone doing positioning work. This provides a high level recap of the HBR article and my tips for application to Brand Positioning. The authors believe that there is a “universal set of building blocks of value that allow companies to come up with new combinations of value that its products and services could deliver”. 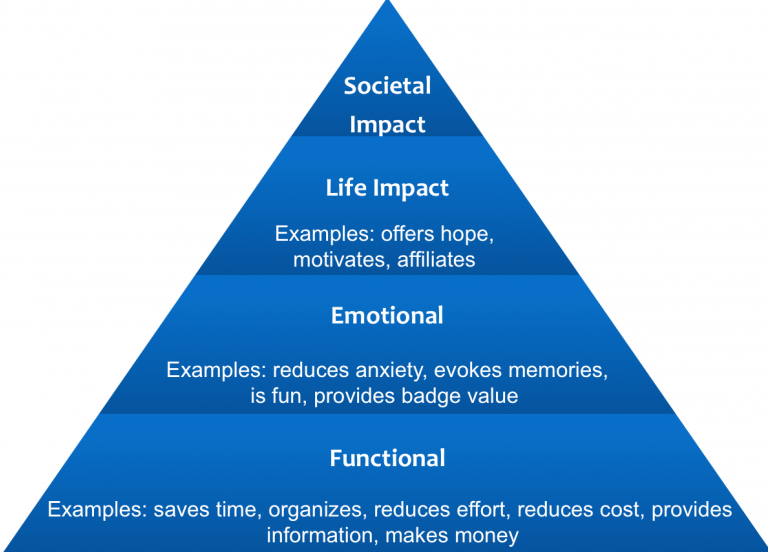 They have identified 30 “Elements of Value” that fall into four Categories of needs in a Maslow-like hierarchy: Functional, emotional, life changing, and social impact. These Categories are oft discussed in Marketing circles, but the unpacking these 4 into 30 distinct sources of value makes it super actionable. For example, “convenience” which frequently surfaces in positioning work is unpacked to reveal: saves time, avoids hassle, simplifies, and reduces effort. Pure-play digital retailers (think Amazon) with “astonishing growth” achieve high scores on many (like 8) elements of value. Discuss the relative importance of each rung in the Pyramid and each individual value element as a driver of Brand choice in your Category. If you don’t have this data, get it! Positioning requires you to understand drivers of choice in your Category. Then understand which Brand(s) are over and under-delivering on each element and why. Again, this is critical data to inform positioning choices. Decide which value elements you want as Points-of-Difference and the feasibility of attaining. Prioritize and make tough choices on which elements you will pursue as Points-of-Difference. Then determine – for all remaining value elements – which must be Points-of-Parity to enable you to be a Category player (Category Points-of-Parity) or to keep a competitor at bay (Competitive Points-of-Parity). What’s left? Any elements you’ve not chosen as Points-of-Difference or Points-of-Parity will likely become Points-of-Disadvantage. Can you live with those? LPA specializes in Brand Strategy and we love “wicked positioning challenges”. We’re excited to see how the Elements of Value can enhance positioning choices.